Like it or not, fifty five percent of the first impression we make is visual. In addition to that, grooming is the number one indicator for self esteem. The good news is that this is an area where we can make significant positive changes that can impact the way others see us. This in turn can have a positive impact on our careers. The rewards of learning a few rules will help you enhance your credibility, boost your self-confidence and convey a more powerful persuasive presence. 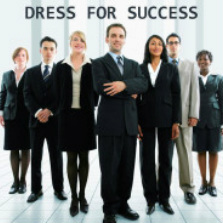 You will learn appropriate attire for the business you're in and the pros and cons to casual business attire. You'lll learn how to choose styles, fabrics and colors that flatter and learn how even small details left unattended can have a negative impact i.e. hair and nails not clean and groomed. You'll learn the importance of well maintained accessories and how to choose accessories that will withstand the test of time. You will observe through demonstration how body language, vocal patterns and habits, such as nail biting, gum chewing, hair twirling etc, can detract from your overall professional presence. How posture, gestures, facial expressions, and movement can enhance or deter the overall impression others perceive.